Who is Meghan McCain Engaged to? Find Out Her Engagement Partner Here.. she flashed her giant diamond ring to her fellow co-host and the audience member..
Who is Meghan McCain Engaged to? Find Out Her Engagement Partner Here! An American columnist, author, former Fox News host, and contributor, Meghan Marguerite is the daughter of 2008 presidential nominee Senator John McCain and Cindy Hensley McCain. But many of her fans recognized by her professional work. Meghan's professional life is an open book but what about her personal life? Is Meghan ENGAGED? Well to know the answer, read the article below. Is Meghan Marguerite Engaged? Who is her Fiancee? Well, the wedding bell will ring very soon. 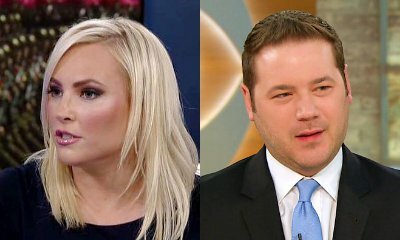 Because Meghan McCain confirmed her engagement to the conservative writer and publisher Ben Domenech. On Thursday morning, she flashed her giant diamond ring to her fellow co-host and the audience member. Meghan opened up about her engagement and are planning for their wedding. She revealed publically about her betrothed for the first time and explained that they got engaged after her dad. "I never thought I would get married and I want the single girls out there to know that like, I don't consider this an achievement; it's just part of my life right now," she continued. "Wait for the men who love strong women...don't settle for less. Don't settle for anything else." After her engagement announcement, she shows off a massive diamond ring. She called Ben Domenech, the most conservative guy in the history of the world. She thinks that she found her ultimate match when it appears to political views. Don't you want to know, when and where did she meet Ben Domenech? If you want to know then here's all the detail information about Meghan and Ben's first meet. Just be with us. Meghan has openly confessed that she has a boyfriend and often talks about him on social media but she never shared any of her and her guy's photo together, but she has made mentioned "MY BOYFRIEND" in several places. If anyone of us has followed Meghan McCain, then you might've seen one of her post on Twitter. And this identifies that she was in a relationship with Ben for many decades. However, she confirmed that she is dating Ben but why she did she hesitate sharing any of her photo with her fiancee. Well, it's all secret. Meghan did not reveal about it. We just hope that she'll reveal it very soon. And once again wish you all the best congratulations as you move towards a new chapter in your life.